To make the crepes, whisk the flour, eggs and half the milk together until well combined. Slowly add the rest of the milk whilst continuing to whisk until a consistency of cream is achieved. Heat a frying pan on a medium heat with 1 teaspoon of oil. Using a ladle, pour in the crepe batter until a thin coating covers the bottom of the pan. Tilt the pan to make sure all areas are covered. Let the batter cook for about 3 minutes and gently loosen the edges using a spatula and flip onto the other side. Continue to cook for 1 minute until both sides are pale golden. Repeat this process with the remaining batter. Carve or shred the duck, using 2 forks to drag the meat from the bone. 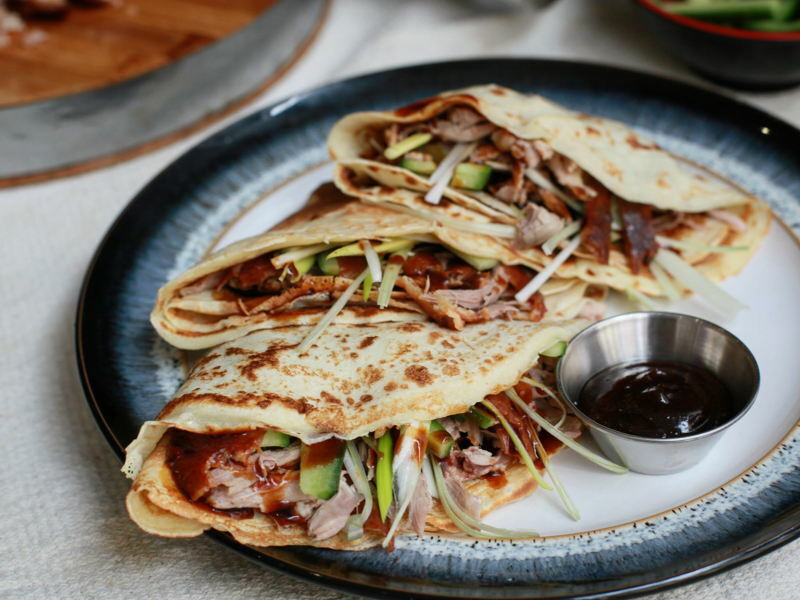 Prepare the cucumber and spring onion and construct your crepes using the hoisin sauce, duck meat, cucumber and spring onion.